The finished right greave for Varian Wrynn. 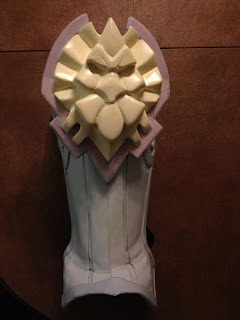 It is constructed of Wonderflex, Craft Foam and the resin cast lion head. Now it is time to prime it. I like to use Gesso to prepare the Wonderflex surface. Not only does paint stick very well, the the Gesso also easily fills in the minor surface flaws.